The United States' most prominent polar explorer was motivated by a strong desire for achievement and adventure. This drove Richard Byrd toward the nascent field of naval aviation and then toward the North and South Poles. Aviation was an important component of his polar expeditions, especially those in the Arctic. In contrast with his more numerous Antarctic expeditions, his earlier Arctic adventures were fewer, characterized by disappointment, limited success, and controversy. In September 1923, Lieutenant Byrd was medically retired from the US Navy, although he remained on active duty due to his political, administrative, and aviation skills. His ambition and growing reputation for invention and leadership led to the young officer's appointment to significant tasks, especially those involving aviation. This resulted in Byrd's assignment to the aviation team that eventually would manage the first flight across the Atlantic (in stages) in May 1919. Disappointed at being denied a seat in the successful aircraft, his navigational contributions and earlier personal contacts secured him a September 1923 assignment to the staff that was to fly the first US dirigible (Shenandoah) across the Arctic and the North Pole. The ZR-1 Shenandoah, based on a captured World War I German Zeppelin, would use mooring masts on two US Navy tenders to fly from Barrow, Alaska, to Spitsbergen. This duplicated the year earlier polar basin flight route scheme by Roald Amundsen during his Arctic drift expedition. Damage to the airship in January 1924 caused President Calvin Coolidge and the US Congress to reconsider the safety of such a hazardous flight. It was canceled by the time a special act of Congress promoted Byrd to lieutenant commander in June. A similar North Pole airship flight would be made two years later in the opposite direction by another party. Denied a chance to fly to the North Pole in 1924, Byrd now grew intent upon a North Pole flight the following year. This time it would be via US Navy aviation support of a civilian polar veteran's Arctic expedition. The US Navy aviation unit left on June 20, 1925 from Wiscasset, Maine, for Etah, Greenland, aboard the expedition's support vessel (Peary). Byrd's flight unit had pilots Lieutenant M.A. Schur and Chief Warrant Officer E.R. Reber, along with three chief machinist's mates and enlisted pilot-mechanic Floyd Bennett. Their aircraft were three Loening amphibian biplanes borrowed from the Army. Byrd had persuaded the Navy and science organizations that he could return with valuable hydrograph-ic, magnetic, and geographical information, including the possible discovery of new territory. He would also be testing aviation in an extreme climate new to the Navy. During August at Etah, Byrd and his unit flew 50 hours, covering about 30,000 square miles. This was despite fewer than four good flying days due to bad weather. Some new geographical features were sighted, but not Peary's apocryphal "Crocker Land." Donald Baxter MacMillan (the organizer of the Crocker Land Expedition, 1913) was sorely disappointed with the results of the Navy flights. The team accomplished two significant flights over the interior of Ellesmere Island, but established only two short-distance cache sites, meaning that no landings at the planned longer-distance forward base on the coast of the Arctic Ocean could be made. 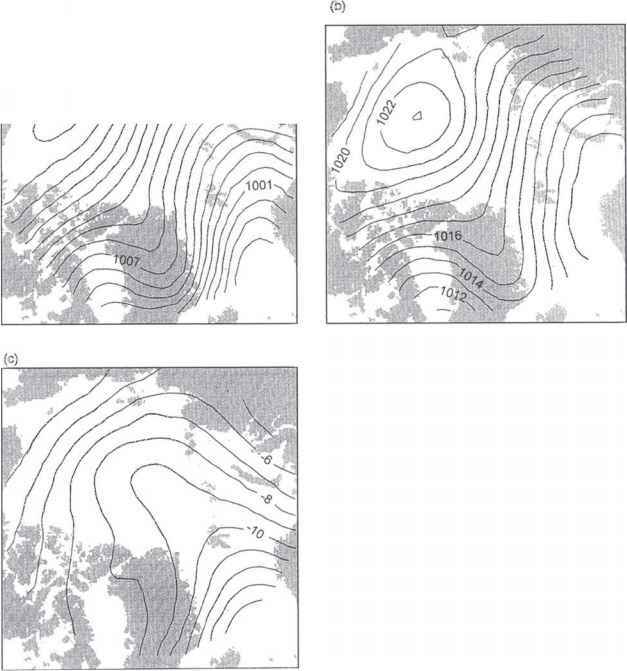 MacMillan probably exercised sound judgment when he overruled Byrd's attempted dash for the North Pole on August 30. The expedition returned to Wiscasset on October 12. In spite of MacMillan's dismal view of Byrd and his expedition support, Byrd's achievements were as promised and important for the future of polar exploration. He learned how to fly in a polar environment, despite having lost two of his three airplanes. Byrd had made the first flights over the Greenland Ice Cap and Canada's Queen Elizabeth Islands, and he was the first to land in Ellesmere Island waters. Using several air navigational aids of his own design, Byrd also pioneered the use of Alfred H. Bumstead's sun compass as well as shortwave aerial radio transmis sion. Most importantly, Byrd's aviation, even with its shortcomings, proved to be a modern polar expedition asset. More territory could be covered in a day's flight than in a month of sledging. Byrd and Bennett next would attempt and claim to have been the first to fly over the North Pole on May 9, 1926. The 50-member Arctic Aviation Expedition left Brooklyn Navy Yard on April 5 aboard a leased ($1/year) vessel (Chantier) with two aircraft. The expedition used a Fokker trimotor monoplane with retrofitted skis and Wright J-4B 200-hp engines, and was named Josephine Ford after the daughter of benefactor Edsel Ford. The plan upon arriving at Kings Bay (Ny-Alesund), Spitsbergen, on April 29 was to make the North Pole after a stop at Northern Greenland. Seeing Amundsen arrive a few days later with the same intention, and already experiencing difficulty with the skis, caused Byrd to take off early on May 9 for a planned nonstop flight directly to the Pole. A right engine oil leak raised doubts about being able to continue. Byrd later reported that with oil pressure holding, and he and Bennett alternating at the controls to alleviate the effects of their sleepiness, they reached the North Pole shortly after 9 a.m. It was generally reported that they successfully returned to Kings Bay at about 5 p.m. (GMT), having averaged about 100 miles per hour on the 1500-mile round trip. The expedition returned via Europe to New York City on June 23, where both pilots were promoted and honored with numerous awards, including a medal of honor from Congress. The time of their arrival caused some to question whether Byrd had traveled the round trip to the North Pole. Bernt Balchen with the Amundsen party in Spitsbergen, and later with the first Byrd Antarctic expedition (1928-1930), raised this issue first. His calculations showed that Byrd could not have made the trip in only 16 hours. Joining this chorus of criticism after Byrd and, later, Balchen's death were noted Swedish scientist G.H. Liljequist and a number of researchers who published articles supporting their conclusions. The critics' general view was that the oil leak hazard led them to decide to fly a lateral back-and-forth course just over the horizon until a reasonable amount of time had elapsed. A publication that contained Byrd's recently discovered notebook further fueled the controversy. The notebook revealed notes from when Byrd was on this flight, which included erasures and calculations that tended to support the argument against his having reached the North Pole. Pete Demas, Byrd's aviation mechanic, was in the process of refuting the anti-North Pole claims before he died in the 1970s. Among the facts he said were in error was that his time of return had been incorrectly reported by about 45 mins. The time of return is a critical factor in this ongoing controversy that has many believing that Byrd did not fly to the North Pole. Biography [subheading] Richard Byrd was born on October 25, 1888, in Winchester, Virginia, to a prominent American family. After attending military school and the University of Virginia in Charlottesville, he graduated in 1912 from the US Naval Academy, Annapolis, to begin his career as a Navy officer. Following a serious injury to his leg, he officially was placed on the retired list in 1916, thereafter being recalled to active duty. Byrd's most significant achievements, including being promoted continually by Congressional action eventually to Rear Admiral, occurred while he was retired. He became one of the early Navy pilots, and made major contributions to US Navy aeronautics and aircraft navigation instruments, while managing important Navy stations and programs. Byrd is best known for his leadership of five Antarctic expeditions (1928-1956). During World War II, Rear Admiral Byrd was commander of a special navy mission that helped establish airfields in the Pacific. Byrd died on March 11, 1957 in Boston, Massachusetts. He is buried in Arlington National Cemetery.